Weston senior Nick Richter is vying for playing time for the 6-1 Trojans, who are shooting to reclaim SWC supremacy and win their 10th straight Class S title. You know things are looking bright for a team when it's not at its best, is loaded with underclassmen and, yet, still finds ways to win. 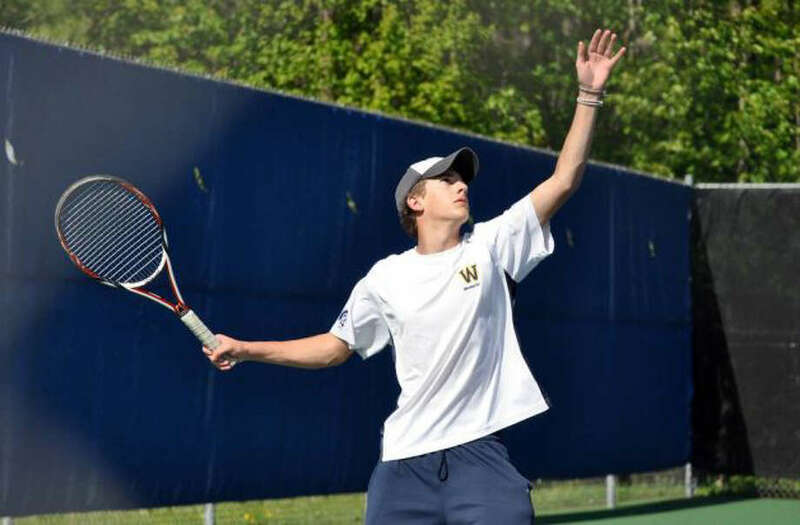 That's the case for the Weston boys tennis team, who has an 8-1 overall record (the lone defeat coming to non-conference foe Glastonbury in a 4-3 nail-biter). "I've got my concerns but I'd say we're moving in the right direction," said Weston Coach Gary Meunier, whose team has held the Class S state championship crown since 2002, but is juggling a lineup of mostly younger players following the graduation of five players from last season. The coach believes there is room for improvement and the team has yet to face some of the tougher SWC foes, including Joel Barlow and Pomperaug. "We've got some decisions to make -- some things to put into place. We're not firing on all cylinders yet," the coach said. The starting lineup in the early going has no seniors, but that could change, said Meunier, adding that the team has balance throughout the lineup and team members will be able to play their way into the lineup in practice -- assuming there ever is any practice the way this wet spring is going. "We've got some kids that are challenging from down below and we've got some time to resolve that," the coach said. "It's harder this year because we're much more even -- from one to five, six is much more even than we've had before. Right now, I think anything's up for grabs. It's a healthy thing. They're pushing each other." Unfortunately for the Trojans, the players haven't been able to push each other as much as they'd like, thanks to some practices being rained out. "It hasn't felt like we're in full swing yet because of all of those factors and variables," he said the depth of the lineup and lack of practice time. "I think we'll be fine. We've got to get some sun and we've got to get some work in. I like what I see. The kids are working hard." In the past, Weston has been led by some standouts, including last year's Class S runner-up Jeremy Schwartz. He was among those five graduates. "There's no one to carry us. Everyone has to take care of business themselves," Meunier said. "We're up and down some days but that's because we're young. I like the competitiveness." Early on, the singles lineup has comprised, in order from the top spot down, sophomore Dave Friedman, junior Cameron Hagen, freshman Oscar Morris and sophomore Josh Weiss. The doubles teams are freshman and sophomore Jack Wallace and Ben Lander at No. 1 followed by freshman and sophomore Henry Morris and Jon Lipsitz and a rotation of players in the third slot. Among those challenging for singles time are junior Ben Smith and senior Nick Richter, and those battling to get doubles court time include seniors Kyle Guerin and Josh Simon. "We just haven't figured out the puzzle yet," Meunier said. Weston has some tough non-conference teams on the schedule, including Staples, New Canaan and Greenwich, all out of the FCIAC. "You get better playing better teams," Meunier said. The Trojans believe their capable of doing a lot this year, including keeping a stranglehold on the state title, and potentially reclaiming the SWC trophy was was captured by Newtown last spring. "We're going to get challenged in the SWC," said Meunier, adding that, in addition to Pomperaug and Barlow, defending champ Newtown (which Weston defeated 5-2 in the season opener) and Masuk are solid teams. "It's going to be different than last year in that we don't have a star player -- but I think we have the talent," Hagen said.